I work with teams and groups - facilitating processes that enable the leadership changes that need to happen for individuals and businesses. There are a number of endangered species on our continent, not least being “The Leader”. I, for one, am impishly optimistic about our ability to conserve and restore real, responsible leadership, but this comes with a caveat: it will take conscious effort on a large scale. Energy is art. Moving a team from where they are to where they need to get to, cannot be achieved via a recipe. There is no magic formula to develop a leader or a team. I am mindful, grounded in the science of business and psychology, and committed to listen to the answers that come from the wisdom of the crowd. The age of the guru is dead: I have a sharp, yet subtle spotlight that helps your team. Change it or DO something about it. Accept it as if I have chosen it. First and foremost, my foundation is to be here, now, turning down the volume of the stream of commentary that comes from my personal value system. I practice mindfulness and the fruit of this is an increasing ability to hear what people and groups really say and really mean. Not with what I think should be said or might be meant. Process Work is my bedrock in understanding the dynamics of change and transformation processes (or the lack of change, as implied by Gailbraithe in his quote above about how little can change even after revolutionary changes in economic ideology). The principles taught by my many teachers in this field help me to make sense of what is emerging in a team or group. I have come to terms with the fact that there is no objective observer and that the best way I can serve my clients is to enable them to interpret their own patterns and behaviour – I need to provide a solid platform, simple observation, and courage to be honest with them. Before I made a 180 degree change in my career to follow my gut feel into the field of leadership development, I worked in my own businesses. I studied management accounting even though my school counsellors warned me not to. One of the best mistakes I ever made! Although it did not turn out to be my main game, the world of business, economics, accounting, law and computers was an education I will never willingly trade. Although I am a registered psychologist, I have no couch, so to speak. I trust research in individual, social and organisational psychology to understand how best I can help clients identify the barriers and opportunities in the process of change or transformation. Leadership decisions alone cannot bring about change. They need to be translated into the real world of the organisation’s day to day life via conscious changes in KPI’s, mental models, communication strategies, structures, remuneration principles etc. The amount of research produced on this topic comes to a sum total that I, personally cannot pronounce, let alone understand. In short, this field is filled with contradictions and complications. I enjoy the challenge of finding the simple truths that stand the test of time and sharing this in equally simple ways. The longer I work in this field, the more I am convinced that the leader’s role is to align and integrate their organisation’s value chain, while seeing that this value chain lie within a wider value chain. A business is part of a value chain of suppliers, producers and sellers. 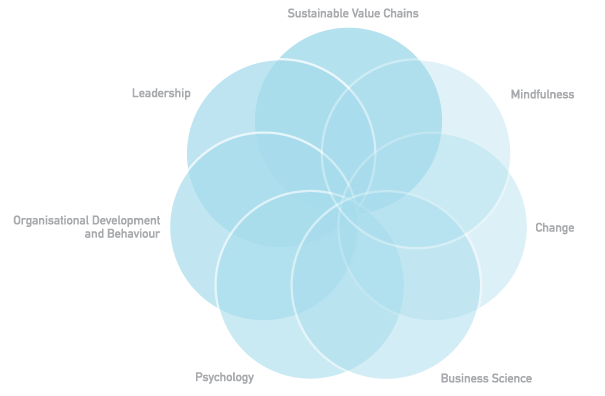 This value chain lies within and depends upon the limited capacity of the value chain of our earth’s ecology. I have a strong entrepreneurial spirit. I established a number of small to medium enterprises over the past fifteen years, among others being a founder member of Capitec Bank. It became clear that my passion and purpose were in the field of leadership development and organisational wellbeing and was fortunate to make a career shift accordingly. I am often complimented for my ability to work with a wide variety of complex leadership challenges. Most of my work consists of facilitating conversations between team members, various links in an organisation’s supply chain or between a variety of suppliers and their customer. Getting different functions and units to work cross functionally is one of the challenges I enjoy most. Other pieces of work include facilitating leadership development processes, culture transformation, mindfulness, value chain integration and emotional maturity programmes for leaders in a variety of businesses. I am a part time lecturer at the Stellenbosch Business School, a plenary speaker at international conferences like the Organisational Design Forum in the U.S.A. and the Supply Chain Forum in Australia and I enjoy making time for part time journalism, writing for CEO magazine on leadership issues and group dynamics. I am really fortunate to work with inspiring and soulful people in wonderful and weird places.